What Makes These Pictures So Funny? In Preston Sturges's Sullivan's Travels (1941) John Sullivan, a movie director traversing the United States in an attempt to define the soul of America, finds himself wrongly imprisoned and part of a chain gang. Invited with the other prisoners to attend a screening at an African American church in a southern bayou, Sully discovers what really speaks to the human condition when he notes the spontaneous and heartfelt peals of laughter generated by the film chosen to amuse black parishioner and white jailbird alike. The film in question? A Disney cartoon. In asserting that Hollywood entertainment finds its purest expression in the cartoon hijinks of Pluto and Mickey, Sullivan's Travels confirms what has become a strongly held assumption; namely, studio-era animation, in particular shorts, has been long associated with comedy. At least as far back as E.G. Lutz's book, Animated Cartoons: How They are Made, Their Origin and Development (1920), a volume that greatly inspired the young Walt Disney, comedy has loomed large in the success of cartoons, evidenced by an entire chapter, "On Humorous Effects and on Plots," dedicated to the topic. Lutz even begins the chapter with the seemingly obvious statement: "The purpose of the animated cartoon being to amuse, the experienced animator makes it his aim to get, as the saying goes in the trade, a laugh in every foot of film." But if equating the short cartoon with Hollywood humor now strikes us as axiomatic, much as it did Lutz in the early days of the studio era, we should resist accepting the logic of the association at face value, if only to explore how the animator's pen came to be enlisted consistently as a primary tool for entertaining the masses through cartoon merriment. Of course, studio-era animation need not be funny, nor was it so at all times. But insofar as the studio system assigned prescribed roles to the types of films produced under its control, and inasmuch as that system's primary goal was to entertain-as the example of Sullivan's Travels is at pains to demonstrate-cartoons chiefly carried out the task of making audiences laugh. Studio executives believed that cartoons were ideally suited to this mission; audiences reinforced that belief by responding to the studio-era cartoon with appreciative laughter; and animators complied by rolling out dozens upon dozens of mirth machines for the nearly five decades that the studio system held sway in the United States. So entrenched was this equation of cartoons and humor that the assumptions underlying it have gone largely unexamined. Why were cartoons assigned this role? Why did cartoon makers, studio executives, and audiences all subscribe to the idea that animation would be most effective if enlisted to engender laughter? If we try to determine how this connection was made and sustained so effectively, do we find its roots in the nature and lineage of animation, the structure and logic of the studio system, or some combination? Surprisingly, these questions have gone unanswered for the most part. In analyzing the long-standing association of comedy and cartoons forged during the years of the studio system, this volume ultimately points to an unavoidable by-product of that association: our ideas about (American) animation have been shaped by the commercial success and social impact of the Hollywood cartoon. Whether by design or by fiat, the role of the animated short became prescribed to the point where few other competing functions could be entertained or imagined. This predominance of "funny pictures," both within the production system and the public consciousness, demands a thoroughgoing exploration of the process by which the broader-based term animation became synonymous with the label cartoon. The aim of Funny Pictures, then, is not to drain the humor out of studio-era animation by explaining it away but rather to elaborate on the ramifications of comedy finding itself so fully ingrained within the form of the Hollywood cartoon for so long. 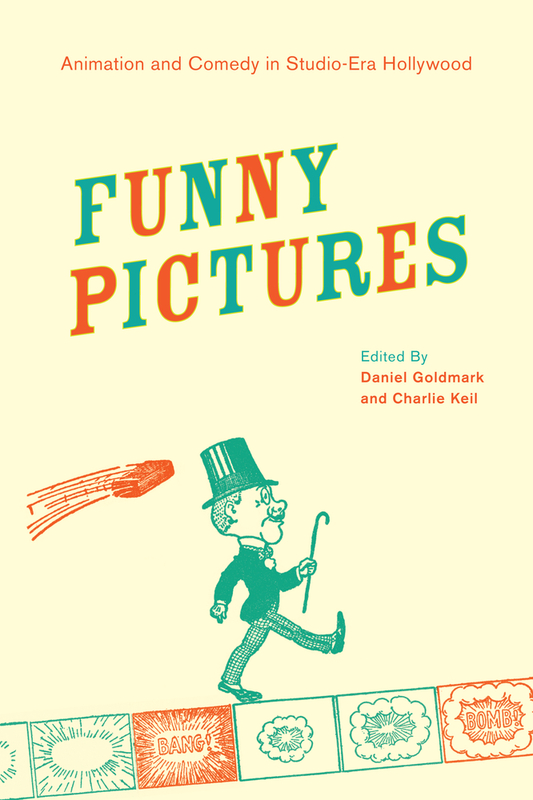 Acknowledgment of the complex nature of the relationship between humor and animation guides the organization of this anthology, prompting balanced consideration of both the historical dimensions and theoretical implications of their union. Adhering to an arrangement that accounts for both the development of animation's role during the fifty-year sweep of the studio era and the relevance of numerous conceptual frames-of representation, narratology, and authorship-to our understanding of animation's social impact and formal functions, Funny Pictures also maintains a clear eye on the influence of the studio system during this period. Any simple assertions that we might be tempted to put forth concerning animation, comedy, the studio era, or any combination of the three, find themselves complicated by the range of arguments and insights advanced by the chapters to follow. Even so, a roadmap seems in order, an overview that sorts out the conflicting messages-of conformity and anarchy, of repetition and deviation, of racism and iconoclasm, of control and resistance-that emerge from any collection as diverse as this one on a topic so rife with its own internal contradictions. So, while the cartoons under examination may simply seem to be playing for laughs, we must forestall for the moment the reactions of the patrons in that swamp-bound church. For Sullivan's Travels, screening Playful Pluto to a roomful of appreciative spectators affirms the studio system's main goal as purveying lighthearted entertainment; for Funny Pictures, the task is to arrest the projector long enough to interrogate how and why humor and animation became so productively intertwined. Comedy + Animation = ? Is Hollywood animation a subset of the broader field of comedy, or is the cartoon a particular (and distractingly popular) strand of animation practice? Can we assume that the general principles of comedy address themselves as fittingly to animated filmmaking of the studio era as to its live-action counterparts? Certainly the gag, the pratfall, and the punch line-all staples of filmed comedy-are prevalent in the Hollywood cartoon. Paul Wells's examination of the links between silent comedy and animation in this volume goes so far as to say that the latter "as a form enabled the greatest possible development and expression of the 'gag' as the new art of the impossible." But if we move beyond checklists of comic ingredients, would we find the same comic spirit informing cartoons? As Scott Curtis demonstrates in his chapter, when applying the Bergsonian notion of the mechanical to the output of Tex Avery, a figure who looms large in the history of Hollywood animation in general, animated work of the studio era not only conforms to canonical precepts of comic creation; it epitomizes the automatism and inversion inherent in the comic process. Automatism is a central concept here, for not only is much of comedy predicated on recognizing the mechanical dimension of human behavior, but animation itself depends on the automatic repetition of near-identical images. Cartoons derive, literally and historically, from single comic images, which served as both the base material of an animated sequence and the antecedents for cinematic animated forms. While the comic-cartoon lineage has been chronicled at length elsewhere, less time has been spent exploring the theoretical and practical implications of the relationship, particularly as it relates to cartoons' perceived affinity for comedy. Writing some thirty years ago, Kristin Thompson, in "Implications of the Cel Animation Technique," offered some of the earliest modern critical theories concerning assumptions about cel animation. The relegation of cartoons to the comic dustbin, in her view, comes in part from animated cartoons' strong relationship with comic strips: "Cartoon production was broadly stylized, usually in imitation of comic strips; it used caricature, stretchiness and flatness in general defiance of the laws of nature. These are all familiar aspects of animation. Hence, only certain types of narratives were considered appropriate to the animated medium: all cartoons were supposed to be comic. Possibly this view originated partly from the fact that virtually all the animators of the silent period came into business from being newspaper comic strip artists (Disney, coming from commercial art, was the first major exception)." While some of Thompson's assertions have given way in the light of more recent scholarship (Max Fleischer was a commercial artist as well as a cartoonist, as Mark Langer's essay here discusses at length), some of the larger points she makes in the above excerpt have not been pursued by film or animation historians. However, it is the remainder of the paragraph that complicates the discussion: "Also, comedy has traditionally been a mode which motivates extreme departures from canons of verisimilitude (as when Groucho advises the audience to go out to the lobby during a musical interlude in Horse Feathers). Since comedy so easily permitted the stylization thought 'natural' to the animated film, an ideological view of cartoons as comic developed." The idea that cartoons suffered from marginalization (in terms of their mode of production, their placement within the exhibitor's bill of fare as a prelude to features, signifying their subordinate status, and their relationship to more conventional forms of filmed entertainment) aligns itself to the differences comedy encourages (straining verisimilitude, facilitating excess, encouraging exaggeration). Several essays in this collection take up particular aspects of the broader question of how humor shapes the operations of cartoons, analyzing how the production of gags affects the construction of cartoon narrative, how humor spurs animation's tendency toward self-referentiality, and how being funny allows Hollywood's cartoons to push the boundaries of Code-enforced decorum, often resulting in laughs that are provocative for their testing of societal and formal norms. What emerges from such investigations is the idea that cartoons used economically enforced limitations (that is, profoundly restricted budgets compared to live-action features or shorts) and aesthetic proclivities in conjunction to boldly go where few other products from Hollywood (save the most enterprising of comic live-action films) ventured. This led cartoons into often uncharted terrain, where unbounded physical transformations rubbed up against decidedly unconvincing backdrops, where merciless lampooning slid into racist caricature and masculinist fantasies. Cartoons push boundaries, often literally, as when the formal parameters of the screen find themselves stretched by the activities of their animated denizens. But they also challenge our social pieties, making us deliberately uncomfortable by celebrating unbridled violence and engaging in crude stereotyping. Yet with this discomfort comes pleasure, be it the shock of seeing our worst impulses rendered in stylized form, the delight in embracing the exaggeration that can only come from a world entirely untethered to a photographic reality, or the recognition bred by repeated familiar styles of drawing. Hollywood animation typically tied this pleasure to humorous ends, often using the extremities of the form as a baseline for comic inventiveness. Perhaps the very obviousness of linking the cartoon and comedy explains why analyses of film comedy have neglected studio-era animation, though one senses this lacuna may owe more to the manner in which animation as a whole is cordoned off in most discussions of film, its isolation from the mainstream of film study mirroring the marginalization of animation as a production practice. But this isolation has prevented those studying film comedy (and no less those examining animation) from determining what is common to both forms. As many of the essays in this collection demonstrate time and again, the interchange between animated humor and live-action comedy is fluid and ongoing: not so much because personnel moved from the one domain to the other but because gags, the stock and trade of film comedy, found themselves repeated and revised as they hopscotched from live-action comic film to cartoon and back again. Influence was reciprocal: seminal live-action comedians from the silent era proved inspirational for certain tenets of animated humor at the same time that animation fed the comic imagination of later film performers. Whether it be Paul Wells arguing for the importance of Chaplin's rhythmic movement to the physicality of the cartoon, or J.B. Kaufman tracing the lineage of the firehouse stock comedy situation from Chaplin through Lloyd and Langdon on to Mickey Mouse, the contributors to Funny Pictures view Hollywood comedy as a phenomenon that meaningfully incorporates animated work rather than standing to one side of it. Perhaps the most powerful example comes from Frank Tashlin, a veritable nexus for all the forms under consideration here, as his work bridges not only animation and live-action filmmaking but also print cartoons (with his strip Van Boring). Ethan de Siefe's essay explores in detail just how acutely Tashlin's identity as a comedic artist forged a continuity between his animated work and the later live-action films he directed. The cultural and aesthetic bonds linking comedy and animation come into clear focus in Henry Jenkins's suggestive extension of J. Hoberman's concept of vulgar modernism to describe a matrix of popular comic creativity that links Avery, Olsen and Johnson, and Spike Jones. Jenkins is at pains to suggest that the traditional boundaries separating comic illustration, vaudeville theater, and the cartoon needn't-and shouldn't-keep us from noting the similarities among artists working across a spectrum of media. That observation can be extended to erode the wall that has been erected between live-action comedy and the cartoon. Attending too closely to what is unique in animation has encouraged scholars to overlook what keeps it in close dialogue with the mainstream of filmed comedy. One of the chief aims of Funny Pictures is to illuminate what ties together the effect of humor and the practice of animating, reinforcing a productive dialectic that the separation of comedy from animation has too often suppressed. Whether cartoons could have been anything other than humorous shorts once Hollywood reached a state of industrial maturity can only be a matter of conjecture, for the fact of the studio era remains that animation found itself assigned the role of court jester. Comedy and animation are not synonymous, by any means, but clearly the former found an ideal expression in the latter. The industry's decision to relegate animation to the peripheral sphere of nonfeature production probably helped foster a perception that the goal of the cartoon was to amuse. Once the film industry moved away from a model of single-reel production in the mid-1910s, one sees comedy commonly associated with the short, as the feature format was generally reserved for more "weighty" material. As early as 1914, industry doxa deemed comedy unsuitable for the extended running time of the feature, exemplified by Stephen Bush's pronouncement in Moving Picture World: "Nor do we believe that multiple reel comedy will ever successfully rival the short snappy comedy of a thousand feet. On the screen as in the newspaper and on the stage brevity is the soul of wit." As Rob King documents in his study of Charlie Bowers, by the 1920s this tendency to equate the short format with humor prompted the Short Feature Advertising Association to devise a campaign promoting "National Laugh Month." In part, the labor-intensive nature of animation dictated that it be restricted to the short format, facilitating the fusion of animation and comedy. But even as the extensive work required to produce a few moments of animation on the screen rendered it an inefficient (and overly expensive) means of producing features during the studio era, the thoroughgoing manipulation of the image track during the drawing process invested cartoons with a special quality of humor. Unlike live-action comedies, where humor could well emerge from the interactions between actors or derive from seemingly spontaneous occurrences before the camera, everything about animation was necessarily premeditated. One can claim with some justification, then, as does Ethan de Seife, that animated comedy was a comedy of extreme preparation, the timing of gags tied to the duration of the moment as it unfolded via the number of cels required. The unique profilmic dimension of animated filmmaking renders it the apogee of studio-era principles of manufacture: nothing is left to chance; everything can be calibrated. Even if the contours of classical editing and camerawork were emulated, they were incorporated into a governing aesthetic of totalizing control via the animation desk. For these reasons animation fits well within the studio system's logic of reducing risk through employment of the most reliable procedures available. Susan Ohmer shows how Disney extended this principle by employing audience research tools, noting that "producing laughter on schedule and for profit, that was the challenge." Film studies' examination of the principles and practices of the studio system has confirmed the truism that predictability of manufacture and variation of product were the two foundational supports for the system's proper operation. Yet this insight into the studio system is largely based on the centerpiece of Hollywood's output, the A feature. How did the ancillary products from the system fit into its broader goals, and to what degree did they represent possible alternatives precisely because of their marginal status? On the one hand, animated shorts share many qualities with the B-studio serials and weekly newsreels that accompanied them as part of the bill of fare preceding the main feature. The output of the animation mills at Warner Bros. and MGM, at Disney and Fleischer, was tied to an idea that audiences wanted the same thing week after week, only slightly different. Perhaps that is why animation has often been described as a genre-because various formulae and conventions proved so determinative of the contours that animation assumed. But at the same time, animation differed radically from fictional features, with their stars and narratives tied to ninety minutes and longer; from serials, with their cliffhanger endings leading audiences to the next installment; and from newsreels, which were tied to events of the day. And of course the distinctiveness of animation's appearance-regardless of the genre (western, musical, melodrama, etc.) that the story might be appropriating-seals once and for all its identity as cinematic "other." If animation was (and is) not a genre, in its Hollywood incarnation it still very much adhered to the generic traits of comedy, borrowing situations and gags passed down from that mode's development in earlier entertainment forms. Fostered as they were by traditions of comedy developed in the funny pages of newspapers, the vaudeville theaters and burlesque halls of turn-of-the-century America, and the slapstick antics of the silent comedians, the cartoon shorts of the studio era developed and extended certain tendencies of American humor by virtue of combining them with the principles of exaggeration and parody that animation could cultivate. What resulted was a hybrid form, one that borrowed brazenly from recognized comic conventions but expanded on them in the artificial, hothouse world of the animated drawn image. If the comic performative traditions of vaudeville informed the content of animation's mise-en-scène, the artisanship of the comic strip artist defined the cartoon's mode of production. From the outset cinematic animation struggled with how to reconcile the painstaking craft of image-making with the rote repetitive manufacture of the multiple cels required to render such images in movement. With some prominent early film animators emerging from the ranks of celebrated still-image comic artists, the lineage manifests itself in obvious ways, particularly the vogue for "lightning sketch" films, an early form of filmic animation. Perhaps the most celebrated example is Winsor McCay, whose early animated films self-consciously explore the possibilities of cinematic space and animation's capacity for instantaneous metamorphosis (as in Little Nemo), as well as the animator's relationship to his fictive creations (Gertie the Dinosaur). As Nic Sammond points out in his contribution to this volume, the insistent trope of the animator's hand in many early animated films foregrounds the act of creating these moving pictures, stressing their handmade quality and, by extension, what Phil Brophy identifies as an outright refutation of the screened body's "fleshiness," pointing to its inherent lack of corporeality. As mentioned, animators, seemingly emboldened by the capacity of their chosen medium, often took situations to comic extremes impossible to realize in live-action film, and the fact that cartoon characters are drawn necessarily complicated standard notions of performance and "physical humor." But the trope of the animating hand also points to the labor involved in the drawing of the images at the core of any animated work, a labor laid bare when the animator is personified within his own comic creation. Such overt acknowledgment of the work underlying studio manufacture runs counter to the general aura of mystification that pervades the studio system. It also implicitly tweaks the overarching principle of process over practitioner that defines the classical era. And the idea of an animation auteur seems to fly in the face of not only the faceless animation mills dependent on cadres of assembly-line workers but also the studio's determination that story and product remain paramount, not the creative individual. Small wonder, then, that those animators whom we might be tempted to nominate as authorial figures were responsible for works that resoundingly reinforced the drudgery of the animation process and the near-existential conundrums defining the depicted realm of most Hollywood cartoons. The twinned forces of mechanical reproduction and formal repetition offset the spirit of comic invention infusing the most spirited cartoons of the studio era. While Rob King highlights how technology could carry with it the promise of "magical productivity," Scott Curtis counters that it also threatened relentless tedium. As a symbolic figure, the studio animator, crafting individual images that would then be endlessly replicated, fused the traditional qualities of the workshop with the modern logic of the factory. This reflects the dual nature of animation itself, which epitomized Benjamin's age of mechanical reproducibility at the same time that it inspired the surrealists. And if the animator could indulge his penchant for what J.B. Kaufman calls the "plausibly impossible," he was also responsible for churning out dozens of derivative cartoon stories that the animation factories produced for decades on end, relying on canonical comic situations in the process. These plot structures formed the basis of much of the cartoons' humor at the same time that they satisfied the compositional principles underlying classical narrative construction. As Richard Neupert demonstrates through a formal analysis of selected works from the 1930s, "most American cartoons are built around carefully unified narratives motivated by clearly defined, goal-oriented characters and chronologically arranged actions that lead toward a strong thematic resolution and discursive closure." Other contributors to this volume are more circumspect, citing the influence of both vaudeville and the comic strip on what Mark Langer calls the "heterogeneous and polyphonic" quality of studio-era animation. If the latter position views the Hollywood cartoon as engaging in what was often a productively uneasy relationship with the overarching principles of classicism, few would dispute that, as products of the studio system, animated shorts were bounded and influenced by that system. Whether independent producers (like Disney or the Fleischers), whose work would be handled by a distributor within a national network, or units within an integrated major (such as the animators at Warner Bros. and MGM), all those making cartoons knew that their product was destined for distribution within a stable and highly controlled system. The oligopolistic nature of the film industry during the studio era delivered a large audience through established distribution channels, but it also dictated that a uniformity of product be maintained, diminishing the chance of radical formal experimentation or contestatory ideological statements. By obeying the dictates of entertainment, the makers of cartoons during this era ensured that their work fell within the studio-sanctioned limits of decorum; at the same time, comedy provided a degree of license that many animators pushed to the extreme. If discussing the studio era as a homogeneous period allows us to forge meaningful connections among works from diverse producers, downplaying the surface noise created by technological innovations (color, sound) and events more pertinent for world history than studio manufacture (World War II), it can also blind us to the distinct changes occurring within this fifty-year period. Many of the contributors align themselves with more period-specific observations tied to distinct eras within the broader swatch of the studio era. If J.B. Kaufman's interest is ultimately the Disney cartoon of the mid-1930s, Susan Ohmer focuses her attention much more on the post-World War II activities of the same studio. Both Donald Crafton and Richard Neupert concentrate on Depression-era Hollywood animation, the former attending to its cultural significance, the latter to its formal qualities. Scott Curtis looks at Tex Avery's efforts at MGM during the 1940s and 1950s; Ethan de Seife tends to concentrate on the same period in Frank Tashlin's career. Henry Jenkins understands the current of vulgar modernism as accelerating in the postwar period, while the tendencies analyzed by Paul Wells and Rob King (in the work of Chaplin and Charley Bowers, respectively) occur primarily in the silent era. Their collective efforts point to the varied nature of animation during the studio years, at the same time that they reveal how different practitioners negotiated their relationships with their industrial overseers. The majority of the entries in this volume concede that many of the qualities that Hollywood cartoons trade on-the elasticity of the depicted space, the porousness of the cinematic frame, the exaggerated lines, and the fantastical universe within which so many of the inhabitants of the animated world reside-lend themselves to humor. But, as Henry Jenkins says, "Comedy is always a messy business." If nostalgic recollection has tended to transform these cartoons into innocent vessels of unalloyed mirth, the contributors to Funny Pictures offer a corrective: they remind us that studio-era animation traded in racist imagery, sexist stereotyping, and mockery of societal mores. Cartoons, even when eliciting laughter, could also prompt tears, and at times the humor could curdle, transforming a comic sensibility into something far darker. Don Crafton, for one, though acknowledging the escapist potential of animated entertainment, also points to its capacity to instill a sense of alienation, convey a cloaked critique, or even offer the hope of transcendence, all of these functions embodied in the shared audience reaction of communal laughter. Still, figuring out how to make a moving drawing elicit laughter remained a key motivation for cartoons of this era. While the gags depicted in these films may well share a heritage with comic traditions established elsewhere, be it vaudeville, music-hall knockabout, or comic strips, the fusion of drawn imagery and the kineticism of movement lent to filmic animation an added dimension of fanciful expression. Doubtless this spurred some commentators to align Hollywood animation with the anarchic spirit of more obviously modernist art movements, while others saw its humorous vitality as indicative of the most salutary aspects of the modern era. More than a few of the contributors to this volume tie cartoons to the uncertainties promoted by modernity, be it Paul Wells in his reading of animation's tendency toward rapid metamorphosis or Phil Brophy's analysis of the endless Coyote-Roadrunner saga as the ne plus ultra of absurdism. In Wells's words, "the human condition, in the view of the absurdists, could only be understood through a perverse, ironic, and sometimes bleak model of humor. Arguably, this sense of 'absurdism' becomes the condition of the animated film per se." Standing in opposition to such a reading of animation is the salutary effect of Playful Pluto on those diegetic viewers depicted in Sullivan's Travels, who might otherwise succumb to despair. According to Don Crafton, Preston Sturges selects the Disney short in part to demonstrate how cartoons offer the power of redemption by provoking laughter. Ultimately, these funny pictures distill, in line and movement, the essentials of comedy and the rhythms of modern life. In the essays that follow, the contributors explore the ways in which the laughter-making potential of animation connects to broader aesthetic impulses, industrially developed conventions, and ingrained legacies of ideology. Collectively, this volume's contributions offer a penetrating analysis of the pleasures offered by a staple of American entertainment during the studio system's heyday while also pointing forward to a vital tradition within American entertainment still evident today in works ranging from The Simpsons to the output of Pixar. That the book ends with a look to the future is thus not accidental. Both Daniel Goldmark's and Linda Simensky's essays share a common purpose: the desire to illuminate how the path staked out by methods and techniques developed during the studio era, whether in narrative construction or sound design, has snaked its way into contemporary animation. With the connection made to more recent work, this book not only shows the indebtedness of modern animators to their studio forebears but also makes a strong case as to the continuing pertinence of a moment in animation history when movies were so often defined by funny pictures. This collection of essays explores the link between comedy and animation in studio-era cartoons, from filmdom’s earliest days through the twentieth century. Written by a who’s who of animation authorities, Funny Pictures offers a stimulating range of views on why animation became associated with comedy so early and so indelibly, and illustrates how animation and humor came together at a pivotal stage in the development of the motion picture industry. To examine some of the central assumptions about comedy and cartoons and to explore the key factors that promoted their fusion, the book analyzes many of the key filmic texts from the studio years that exemplify animated comedy. Funny Pictures also looks ahead to show how this vital American entertainment tradition still thrives today in works ranging from The Simpsons to the output of Pixar. Daniel Goldmark is Associate Professor of Music at Case Western Reserve University and the author of Tunes for ‘Toons: Music and the Hollywood Cartoon (UC Press). Charlie Keil is Associate Professor of Cinema Studies at the University of Toronto and the author of Early American Cinema in Transition and American Cinema’s Transitional Era (UC Press).